I’d see it on a t-shirt or on a bumper sticker, the command “Eat more kale.” It wasn’t something I grew up eating, and I’d think to myself, I’m going to have to try it, this kale. My first encounter with it was at the farmers’ market where it was easy to find, and later sturdy bunches of it were often included in our CSA share. Its scarcity during the early years of the Winter Farmers’ Market, when kale is at its sweetest, made me appreciate it even more. We’d planted two short 20 inch rows, one of Red Russian and the other of Siberian, back in early April under a cold frame, maybe a dozen plants in all. It may be due to this season’s favorable conditions but they’ve been faithful producers ever since. We had one last harvest before clearing the bed, yielding a hefty two buckets full. Fortunately, it’s not the last of our kale, there’s still more under cover. However, the awaiting crop doesn’t mark the passage of time the way these do, with their notched stems ticking off the days between now and then. This entry was posted in garden and tagged kale. Bookmark the permalink. it sounds like you have become a fan of this cold hardy nutrition powerhouse of a plant! Welcome to the club. :D They really do give great value in the garden for the modest space they use and fresh greens in the darkest days of winter are always appreciated. I do wish my brother would eat greens then I could justify the space in the garden. The only greens I get are the beet greens when I thin my beets in the spring. I’ve come to love my kale, too, especially the kale I snip from my garden right before dinner. I use it in soups, omelets, salads, smoothies and just steamed. I can’t get enough! I am still in the “waiting to try’ boat. Not at any of our markets yet and at the store it is well- more rubbery looking or limp. bleh. Beautiful! We had never eaten kale until a couple of years ago. We bought our first kale at the farmer’s market too! I have to say we are now Kale Lovers! It is very productive, will last through the winter and is very good for you! I’ve never tried kale before. I’m going to have to try it!!!! Looks good. 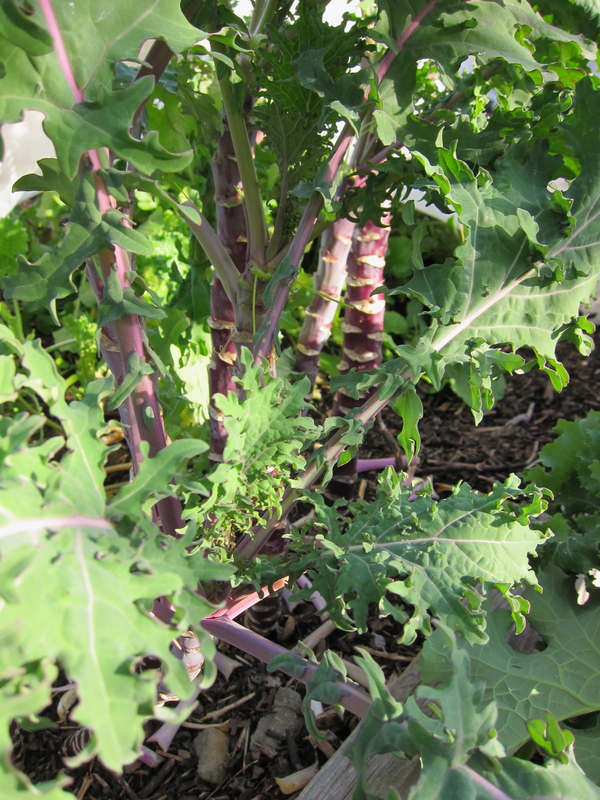 Healthy looking kale plants. You can cook kale in so many different ways and all so delicious. 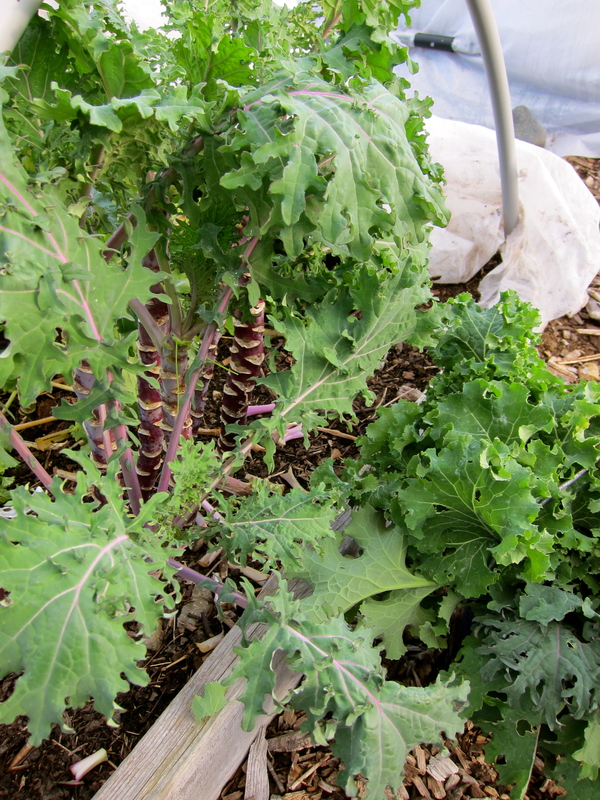 I never had kale until I grew it myself a few years ago; now it’s a staple in the fall and winter garden. Mostly I grow the red russian or ragged jack, but this year also lancinata, an Italian kind. It shocks me that so many people haven’t tried kale. It is a real staple in my house, and after visiting Portugal some years back, I dream of Portuguese Sausage and Kale Soup. It is really good stuff. I highly recommend trying Lacinto Kale, also known as Dino Kale. I think it is the easiest to fall for, but lately I have been eating tons of Portuguese Dairyman’s Kale. It is equally delicious. Saute a little garlic, onion and red pepper flakes in olive oil, throw in the chopped kale and a couple glugs of stock, and cook on low for 10 to 30 minutes. A little salt and pepper and you are in business. Mmm, kale, what a wonderful vegetable. Everyone should eat (more) kale. I’m with Erik, the Lacinato kale is my favorite kale, but I’ve never met a kale that I don’t like. Have you tried kale pesto?